Turkey is preparing to publish a document that represents a revolutionary reinterpretation of Islam - and a controversial and radical modernisation of the religion. The country's powerful Department of Religious Affairs has commissioned a team of theologians at Ankara University to carry out a fundamental revision of the Hadith, the second most sacred text in Islam after the Koran. 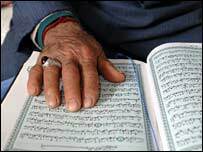 As such, it is the principal guide for Muslims in interpreting the Koran and the source of the vast majority of Islamic law, or Sharia. But the Turkish state has come to see the Hadith as having an often negative influence on a society it is in a hurry to modernise, and believes it responsible for obscuring the original values of Islam. It says that a significant number of the sayings were never uttered by Muhammad, and even some that were need now to be reinterpreted. 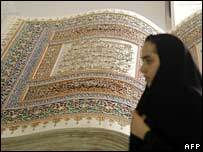 Commentators say the very theology of Islam is being reinterpreted in order to effect a radical renewal of the religion. Its supporters say the spirit of logic and reason inherent in Islam at its foundation 1,400 years ago are being rediscovered. Some believe it could represent the beginning of a reformation in the religion. Turkish officials have been reticent about the revision of the Hadith until now, aware of the controversy it is likely to cause among traditionalist Muslims, but they have spoken to the BBC about the project, and their ambitious aims for it. The forensic examination of the Hadiths has taken place in Ankara University's School of Theology. An adviser to the project, Felix Koerner, says some of the sayings - also known individually as "hadiths" - can be shown to have been invented hundreds of years after the Prophet Muhammad died, to serve the purposes of contemporary society. "Unfortunately you can even justify through alleged hadiths, the Muslim - or pseudo-Muslim - practice of female genital mutilation," he says. The argument is that Islamic tradition has been gradually hijacked by various - often conservative - cultures, seeking to use the religion for various forms of social control. Leaders of the Hadith project say successive generations have embellished the text, attributing their political aims to the Prophet Muhammad himself. Turkey is intent on sweeping away that "cultural baggage" and returning to a form of Islam it claims accords with its original values and those of the Prophet. But this is where the revolutionary nature of the work becomes apparent. Even some sayings accepted as being genuinely spoken by Muhammad have been altered and reinterpreted. Prof Mehmet Gormez, a senior official in the Department of Religious Affairs and an expert on the Hadith, gives a telling example. "There are some messages that ban women from travelling for three days or more without their husband's permission and they are genuine. "But this isn't a religious ban. It came about because in the Prophet's time it simply wasn't safe for a woman to travel alone like that. But as time has passed, people have made permanent what was only supposed to be a temporary ban for safety reasons." The project justifies such bold interference in the 1,400-year-old content of the Hadith by rigorous academic research. Prof Gormez points out that in another speech, the Prophet said "he longed for the day when a woman might travel long distances alone". So, he argues, it is clear what the Prophet's goal was. Yet, until now, the ban has remained in the text, and helps to restrict the free movement of some Muslim women to this day. As part of its aggressive programme of renewal, Turkey has given theological training to 450 women, and appointed them as senior imams called "vaizes". They have been given the task of explaining the original spirit of Islam to remote communities in Turkey's vast interior. One of the women, Hulya Koc, looked out over a sea of headscarves at a town meeting in central Turkey and told the women of the equality, justice and human rights guaranteed by an accurate interpretation of the Koran - one guided and confirmed by the revised Hadith. She says that, at the moment, Islam is being widely used to justify the violent suppression of women. "There are honour killings," she explains. "We hear that some women are being killed when they marry the wrong person or run away with someone they love. "There's also violence against women within families, including sexual harassment by uncles and others. This does not exist in Islam... we have to explain that to them." According to Fadi Hakura, an expert on Turkey from Chatham House in London, Turkey is doing nothing less than recreating Islam - changing it from a religion whose rules must be obeyed, to one designed to serve the needs of people in a modern secular democracy. He says that to achieve it, the state is fashioning a new Islam. "This is kind of akin to the Christian Reformation," he says. "Not exactly the same, but if you think, it's changing the theological foundations of [the] religion. " Fadi Hakura believes that until now secularist Turkey has been intent on creating a new politics for Islam. Now, he says, "they are trying to fashion a new Islam." Significantly, the "Ankara School" of theologians working on the new Hadith have been using Western critical techniques and philosophy. They have also taken an even bolder step - rejecting a long-established rule of Muslim scholars that later (and often more conservative) texts override earlier ones. "You have to see them as a whole," says Fadi Hakura. "You can't say, for example, that the verses of violence override the verses of peace. This is used a lot in the Middle East, this kind of ideology. "I cannot impress enough how fundamental [this change] is." "This is kind of akin to the Christian Reformation. Not exactly the same, but... it's changing the theological foundations of [the] religion"
"Some messages ban women from travelling without their husband's permission... But this isn't a religious ban. It came about because it simply wasn't safe for a woman to travel alone"
"There's also violence against women within families, including sexual harassment... This does not exist in Islam... we have to explain that to them"